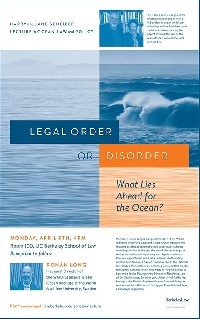 Please join us for the first annual Harry and Jane Scheiber Lecture in Ocean Law and Policy. Professor Ronán Long, Director of the WMU-Sasakawa Global Ocean Institute at the World Maritime University, will provide the inaugural lecture and explore the future of global ocean governance amidst increasing ecological and political challenges. Professor Long is a leading expert on the law of the sea, the law of climate change, multilateral diplomacy, and dispute resolution. The lecture series recognizes the influential scholarship of Harry N. Scheiber in ocean law history and policy and the Scheibers' joint contributions to advancing the subject through the Law of the Sea Institute's conferences and publications. The lecture begins at 4pm and will be followed by a reception in the adjacent West Courtyard.